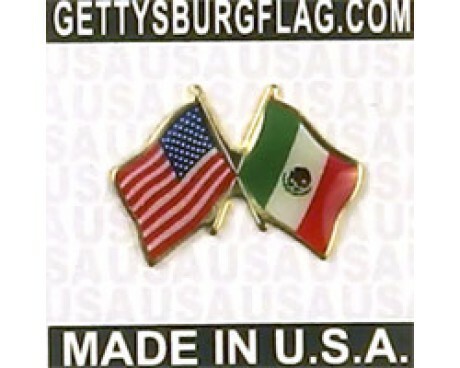 The Mexico flag is a brilliant display of red, green and white accented with the national coat of arms featured prominently in the center white stripe. The colors were chosen in honor of Mexico's national liberation army and were adopted after New Spain (Mexico) finally gained independence from Spain. The new sovereign nation was called Imperio Mexicano. The coat of arms is reminiscent of the Aztec symbol for Mexico City, or Tenochtitian, which was the center of the Aztec empire. Though the flag has been modified several times over the years, the overall design has remained generally the same since 1821, with slight variations adopted each time a change was made. 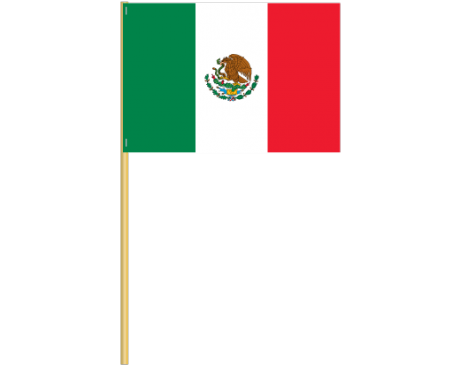 As with many national flags, the Mexican flag has evolved along with the United States of Mexico. It is a federal republic located south of North America. The colors originally stood for independence (green), purity of religion (white) and a striving for unity between the native races and the Spaniards (red). Now they stand for hope (green), purity (white) and religion (red). The designed is based on the French Tricolore and is charged with the national emblem. 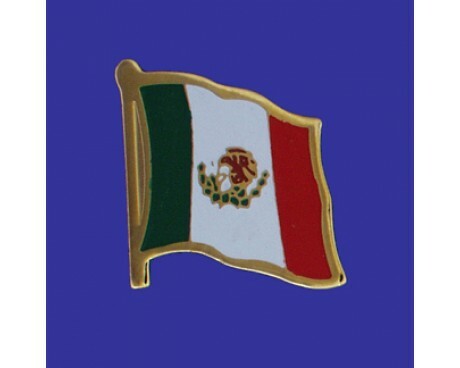 The national emblem is a modern version of an ancient Aztec symbol. According to legend, an eagle clutching a snake in its talons, and standing on a flowering nopal cactus growing from a rock in the middle of the Tenochtitlan Lake, appeared on the site where the Aztecs had decided to build their capital in 1325. The particular version of the emblem used today was updated in 1968. Mexico flags have changed at least four times over the years. In 1821, when Mexico became an independent nation, the imperial parliament adopted the vertical tricolor flag of red, white and green with the national coat of arms. The coat of arms at that time contained only the eagle with its head beneath a crown. In 1823, when Mexico became a federal republic, the flag was revised only by appearance of the coat of arms. The crown above the eagle's head was removed and the eagle's right talon held a serpent. The 1823 Mexico flag was also the first to include the oak and laurel branches, which are still included on the current flag. 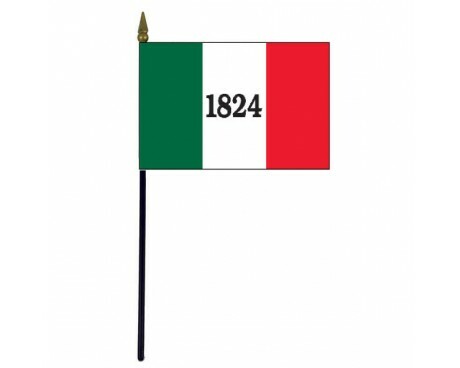 When the Second Mexican Empire was established in 1864, the flag was changed once again. This flag continued the vertical tricolor with the coat of arms displayed in the center white stripe, but at each corner of the flag were placed four crowned eagles in an apparent attempt by the Emperor Maximilian to emulate the French Imperial arms. 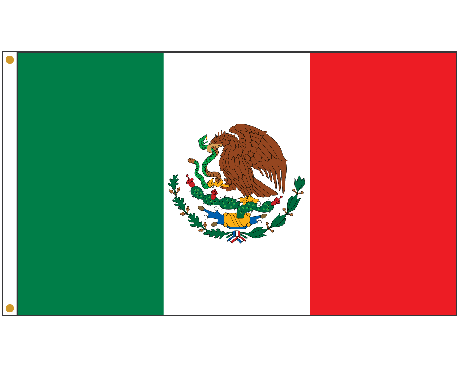 Finally, in 1968, Mexico adopted the current national flag. It features the same vertical tricolor with emblazoned coat of arms at center stage on the white stripe as the other flags, with the side facing eagle on the coat of arms adapted from a design approved in 1916 by decree of President Venustiano Carranza. 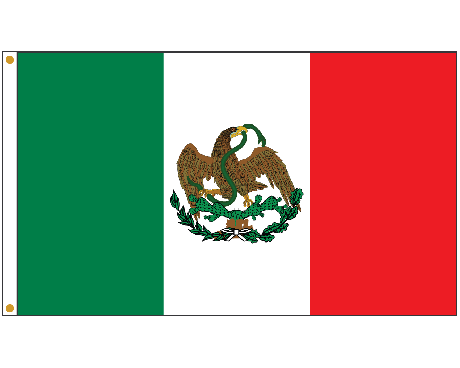 The current flag design is described in Article 3 of Mexico's 1984 Law on the National Arms, Flag, and Anthem.